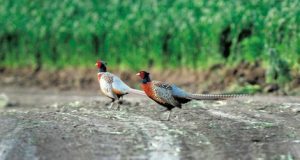 Ohio pheasant hunting has not exactly been at the top of the list for pheasant hunters who come from out-of-state to hunt. Those pheasant and upland bird hunting choices would be South Dakota, Kansas, Alabama, Illinois, North Carolina, Texas, Vermont/New England, or Virginia other than for Ohio pheasant hunting individuals. Probably the best pheasant and upland bird hunting for Ohio is by Ohio sportsmen themselves–as one out of every seven Ohio citizens hunt or fish, with 490,000 Ohio sportsmen providing more Ohio jobs (33,015 jobs) than the Ohio State University (26,000 jobs), equal to $823 million dollars worth of salaries and wages and a state tax revenue of $139.5 million. And then to top it off, the Ohio spending by their Ohio sportsmen ($1.7 billion), which includes the Ohio pheasant hunting areas, exceeds the combined receipts of the Titanic, Star Wars, and E.T. movies, which is $1.49 billion. Last fall, more than 15,000 pheasants were released in Ohio for pheasant hunters in 29 public hunting areas to keep the quality of pheasants available for Ohio pheasant hunting. Also available are late-season pheasant season that remains open until January 7, 2007, along with the deer firearms season that reopens in Ohio on December 16 and 17 only, along with their wild boar hunting season open year-round which is being encouraged to all hunters. And to top it off, Ohio has added 5,000 new acres of hunting ground that was made possible by Ohio’s Department of Natural Resources, located in the state’s southeast region. This is not only good for Ohio pheasant hunting but also is good news for Ohio’s turkey hunters, who gained 15,896 contiguous acres in Vinton Country as a working forest and for outdoor recreation. Southeast Ohio provides the area, Hocking Hills, for not only Ohio pheasant hunting but also offers striking landscapes, vast woodlands, with many varieties of vegetation and rock outcrops. For those who enjoy hunting and fishing in addition to enjoying the scenery, the most preferable spots are the Zaleski State Forest, Tar Hollow State Park, Wayne National Forest, and Hocking State Forest. But remember that age and residency status determines what type of hunting license would be needed to hunt or trap all legal game in the state of Ohio. But all in all, what is available is over 10,000 acres of deep forests, trails that appear out of nowhere as if hidden, cliffs that soar into the air, and secluded caves that appear obsolete to the modern world all added features to the Ohio pheasant hunting week-end, offering a world of choices for pure enjoyment.